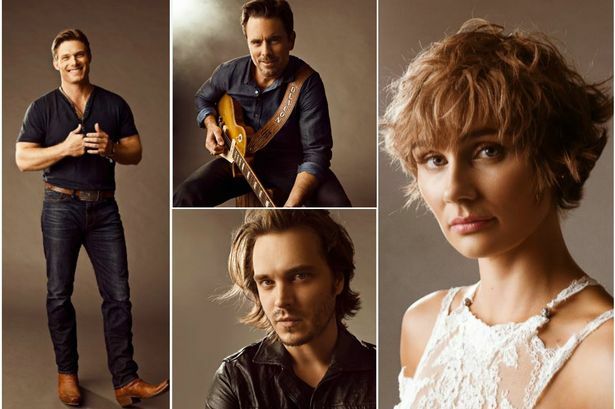 Nashville is a tv show that has become a true cult classic. It is currently on its fifth season and is still very much loved by all who see it. 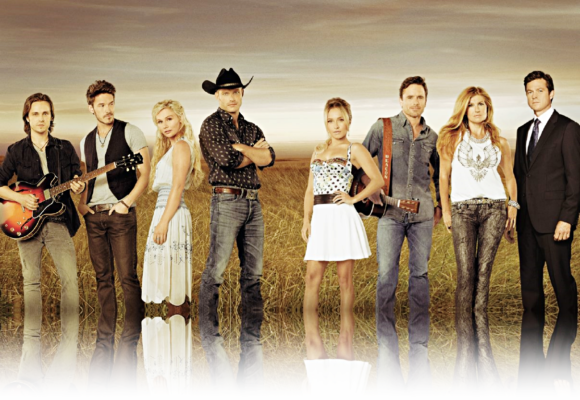 The love for this show is not just with country music fans either as I know many people who watch it as they love the storylines, the characters and of course, the music too. Whilst for me, the music is the best part, I also really love the storylines, even though they can be too dramatic at times but I guess that’s the point. The characters in the show are played so well and the actors are also real musicians which makes their roles more believable and also a joy to hear that the actual singing is really them. The characters are so important to the fans, each and every one is relatable and loveable. When ABC cancelled the series, right on a cliff hanger, our hearts were broken, as were the cast and crews. With the fans getting together and making a lot of noise, CMT heard the cries and picked up the show. We, the fans, could breathe again, those important stories can continue to be told, the music gets to still be played and the show gets to live on which hardly ever happens when a show is cancelled. The popularity of Nashville goes beyond just sitting at home and watching a tv show. 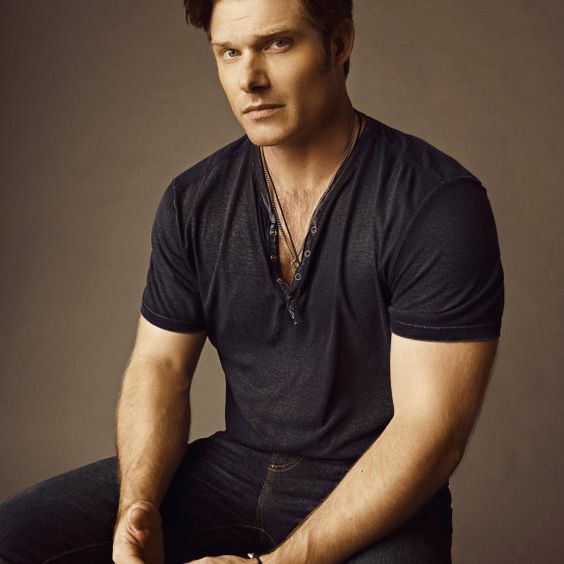 The soundtracks are always a huge success and that is down to the actors each being talented musicians themselves, the team who find the music and that the calibre of songwriters who wrote the music of Nashville are second to none. The music is so successful that over the last couple of years, the cast got to take the music on tour around the world. 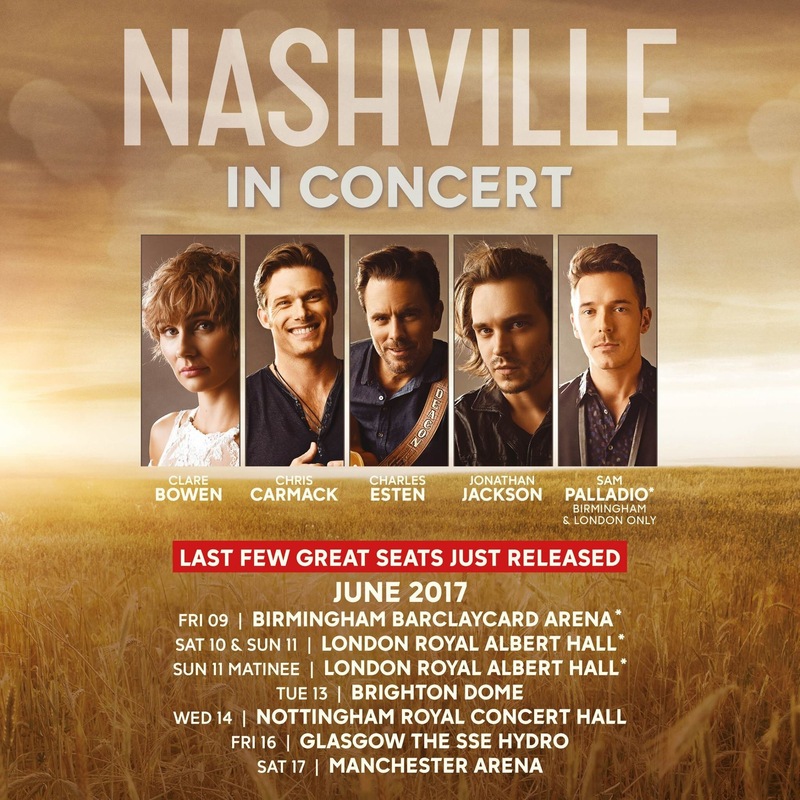 The cast toured in the UK last year with Charles Esten (Deacon) , Clare Bowen (Scarlett), Sam Palladio (Gunnar) and Chris Carmack (Will). This year, all four cast members returned with the addition of Jonathan Jackson (Avery) and they played a series of sold out UK shows including sold out shows at The Royal Albert Hall. 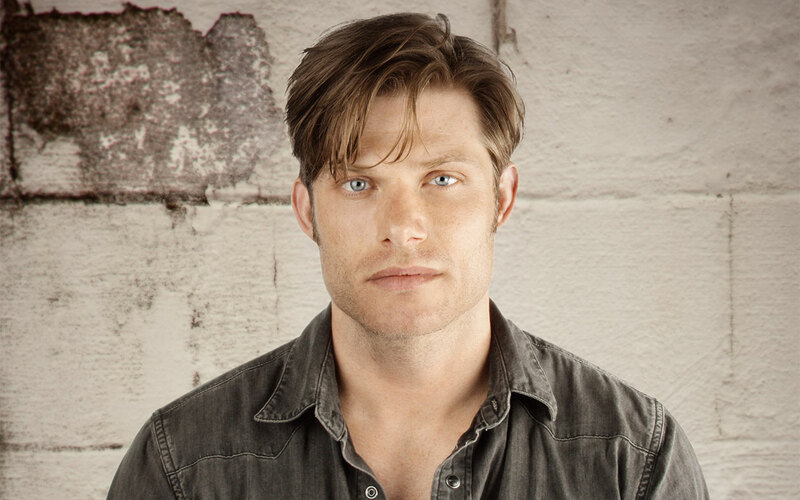 I caught up with Chris Carmack who plays Will Lexington during his time here to discuss the tour, the music and playing such an important role as Will. I found Chris a joy to speak to, he was friendly, funny, down to earth and made me feel very comfortable. Chris was also incredibly interesting and I thoroughly enjoyed this interview and I hope you do too. There may be spoilers if not up to date with the US. Oh, I am good thanks; I am very well, how are you? I am great, are you enjoying the UK sun? Yes, we actually got to take a walk along the seaside and enjoy a beautiful fresh breeze and beautiful sunny day. I didn’t get as much of it as I would have liked, but I did get a bit. Welcome back to the UK; we are so incredibly happy to welcome you back. How has this tour been for you – because, not only have you pretty much sold out the entire tour, but three dates at The Royal Albert Hall as well! How does that feel? Incredible! If you asked me if it was a total bucket list, I would say no, it wasn’t a bucket list moment – because I couldn’t possibly have conceived that. So it was better than a bucket list, it was something that I didn’t even know was possible. Yeah, or Carnegie Hall – it’s such a huge Iconic, beautiful venue, it’s just incredible. It is. I saw the show on Sunday and I have to say it was absolutely fantastic. Oh thanks, which one did you come to? Oh ok, haha, thanks! Yeah, we had fun at the matinee; we were working out a few kicks with the filming equipment that was on stage. Aww, well I don’t think anyone noticed. When you first signed in to do the show Nashville, how much did you actually know about it and did you ever expect it to lead to so many opportunities, let alone a world tour? Well, I was hoping it would lead to certain musical opportunities, you know. T Bone Burnett was supervising the music at the time and I was going to get to record some songs with him. I had been playing and writing music and trying to record for a very long time on my own, but I just hadn’t released anything as it was just this little secret thing that I was doing. I mean I played in clubs around Los Angeles but I never really tried to make a stink of it because I had seen so many actors do their music project and it didn’t work and I didn’t want to do that. I love music so much that I didn’t need it to be a career; I was just able to enjoy it on a smaller scale. But when this job came along, I did start thinking ‘Hey, you know, this is going to lead to some opportunities. I’ll get to play some more gigs and I’ll get to record some of my own music.’ But I didn’t expect it to turn into sold out tours in the UK, Royal Albert Hall, sold out tours in the States; it’s surpassed my expectations in a beautiful way. It is amazing and we are so glad that you get to bring the tour here. On the tour, one of the most wonderful things about it is that you get to perform your own music as well as the music from the show so, on tour you get to be Will in a way – but for the most part be Chris and perform your music as you. Yeah, we discovered that along the way. We didn’t know what was going to happen and we didn’t know if people were going to be upset about it or they just wanted to see the characters. We didn’t really know what it was going to be like but at the same time we kind of had the advantage of being one of the first ones doing this, haha! So we got to do what felt like the most special show to us and clearly that has reverberated with the fans who come and see the show time and time again – so we must be doing something right! Oh definitely – and, as I said, it’s great to see you all perform and prove that you are all real musicians. When the show was cancelled by ABC were you shocked – and did you ever imagine that the fans would protest – and even more that the show would get picked up again. Well, in truth, no – I wasn’t shocked that it got cancelled, because every year we were wondering. We were one of those bubble shows that could come back or not and so every year we would be biting our fingernails waiting to find out. Thankfully we had this nice long run on ABC and then it all came to an end and we were all terribly disappointed – but I certainly wouldn’t say I was shocked. We all knew we had a very loyal fanbase and we all knew that the show could go on – it was just a case of ABC feeling it wasn’t right for their line-up. The fans felt strong enough to rally and make their petitions and that got loud enough that CMT perked up their ears and said ‘You know what? We want those eyeballs; we want those fans on our network.’ So we revived our show and brought it over to them and we are very grateful for that – and we are very happy to be continuing the stories and playing the music and doing the tours. I don’t think anyone is sick of it yet. Well, I am very grateful too that the stories got to continue and for Will’s storyline in particular. Playing Will must be quite a privilege as he is representing a whole community that can really look up to him and be inspired by him. In the show, there was a scene outside his house where he thought he was about to be beaten, but in fact it was just a man thanking him for helping him with his journey and facing up to his challenges with his sexuality. Have you yourself had similar situations from fans who have been grateful to you for bringing the role to life, because he is such a vital character and, even though it shouldn’t be, it is still a difficult challenge to face for both regular folk and celebrities. Yeah, I really have actually. I have had a lot of people come up to me and tell me thank you for playing this role. I have had a lot of guys come up to me that could be Will Lexington; they have come up to me in cowboy boots, flannel shirts in a restaurant or wherever I am and say “ I am a gay man and I want to thank you for playing this role.” I was like ‘Whoa! 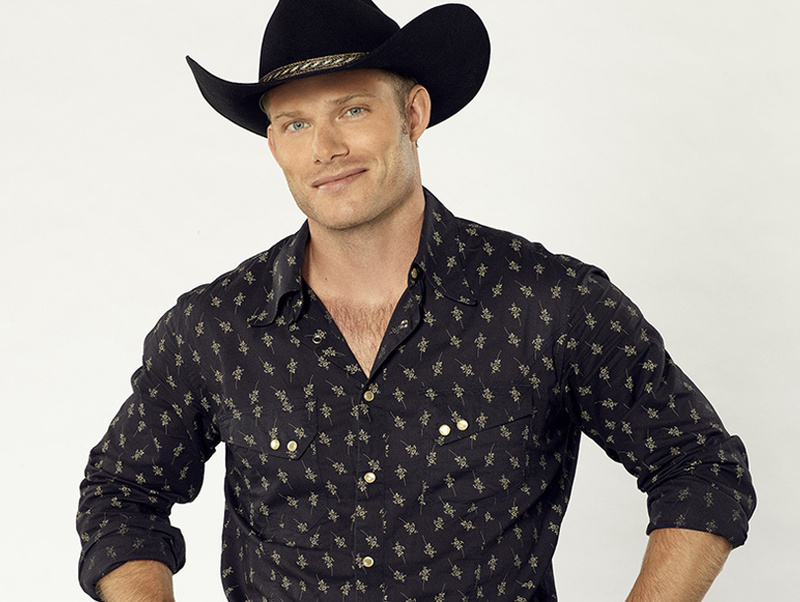 You know Will is not a very stereotypical role on television? 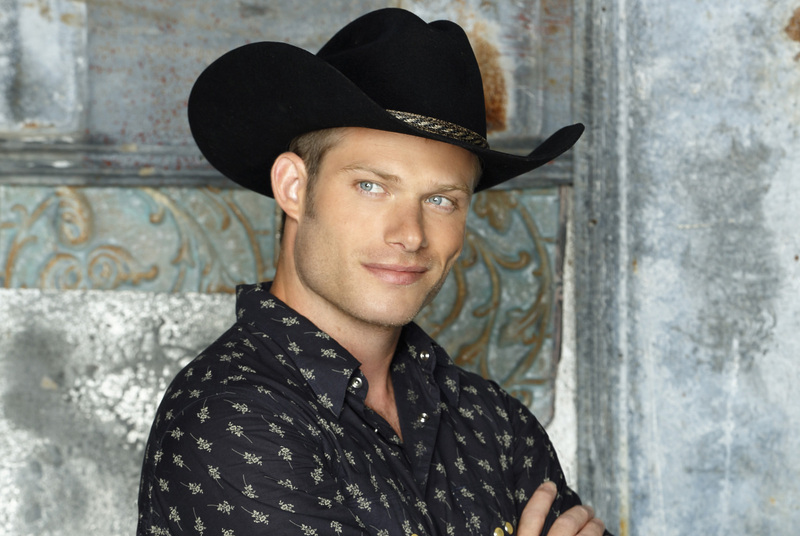 He is a Country music lovin’, thrill seeking, good old Southern boy who happens to be gay. It really is lovely to get to play a role like that which resounds with fans and is appreciated. It makes a difference to people in their personal lives and really, as an actor, that’s the greatest honour that you can have – it’s the greatest role you can play; something which has really affected people on a real level. I can understand that. Friends of mine have said how much they have loved seeing a gay character on the show and have him face the genuine struggles of trying to be someone he is not. The song Is That Who I Am moved my friend to tears. That song (Is That Who I Am) and Stand Up seem to be really important songs in Will’s life. Did you sit down with songwriters to get a feel of the story behind the song – or did you create your own interpretation of the songs to fit with Will’s storyline? Well, those songs are so spot on. I was not involved in the writing process, but when I received them I knew they were very special and I had the privilege of recording them and performing them. In terms of them being selected for the show, I can’t take any credit for that -there are a lot of brilliant music supervisors who search the vaults for the best stuff they can find. What has been the biggest challenge playing Will? Wow! The biggest challenge playing the role? I mean I have had some really heavy scenes but I don’t really take that as a challenge, haha! No, here’s an example. I do know what the most challenging thing is, as an actor – it’s that it’s easy to follow your instincts and create the scene that works – but because I had a sense early on that Will Lexington is a role that is affecting people on a very real level it’s setting an example. In some ways, although it’s fictitious and unprecedented in Country music, there is a certain responsibility which goes with the choices that I make as an actor. I always have to sort of run my choices through that filter and decide if this is the version of Will Lexington that I want to put out there. Don’t get me wrong, I do not ‘play’ Will Lexington, I know him well. He is not a perfect human being and I will lean into his flaws and I will lean into his weaknesses as well, because he is like a real person. We all have flaws, but sometimes, when we are dealing with some of the material that is more around the LGBT scenes, I really have to put a sensitive gear on it, because I want to do it right; I want to get it right. I can completely understand that and it is important to make a role relatable which you have succeeded doing very well. What are your thoughts on his current beau Zach? 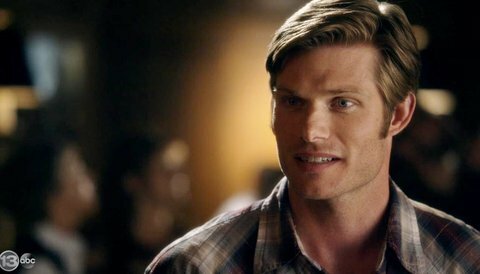 Do you think he is good enough for Will? Yeah, you guys aren’t quite there yet in the UK right? No, we are behind – but I have seen them, shhh!, Haha! I don’t want to give you too many spoilers, but I will say that Zach comes along and shows an interest in Will who finds himself in a sensitive and susceptible place and he decides that he is ready to try another hand at love – and, of course, there’s professional conflict of interest there. Zach is involved with the label and Will finds himself as a bit of a go-between – between the label and his friends who are on the label – and he finds himself in some really uncomfortable situations. I miss Kevin too, yeah. That was a tough one for me personally because I love Kyle, who played him; he is a great actor to work with and I loved the storyline of Will and Kevin but what are you gonna do? Just have him settle under a happy relationship? Haha! You know it’s time for drama, haha but, as a fan of the show, I am with you. I think that Kevin was perfect for Will and that Will’s a frickin’ idiot for screwing it up, haha! I think everyone on the show is or has screwed up their relationship at one point, haha, so Will is definitely not alone there. Haha yeah, exactly, Will is not the only one! Tell us about your own music. You released an EP Pieces Of You in 2015, which I love – can we expect any new music soon? Oh well, thank you! Yeah, I have been writing a little bit and working on some new music but everything has taken a bit of a backseat as I had my first baby. Thank you! Yeah, I am a new dad and she is nine and a half months old – she was born the first week that we started filming. My fiancée was pregnant the summer before, so I went out with the cast tour – but I didn’t really do much to support my EP. I had this big plan to make this EP and when the summer comes along and I’d go out and tour and support it, but that didn’t happen. Then of course, because I was gifted the greatest joy of my life, which is my daughter, the original music has taken a bit of a backseat at the moment due to my becoming a new father and taking that journey. Well, that is very understandable. As a mum myself, I know how little time there is but, as you say, the greatest joy of our lives, for sure. Chris, thank you so much for talking to me today., It has been an absolute pleasure and I really hope that you all come back soon, whether that be as part of a ‘Nashville’ tour or for your own music. You have already proven that you will sell out tours every time you come here. Well, I hope we will come back soon and thank you for chatting with me Hannah, I appreciate it. Have fun for the rest of the tour.